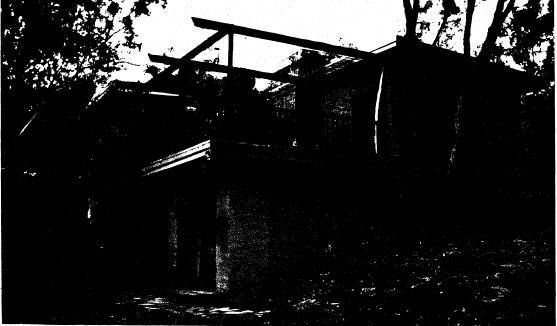 The c1948-49 Busst house and the surrounding site to the title boundaries. The house is historically, architecturally and aesthetically significant to the Shire of Nillumbik and, potentially, to the State of Victoria. The house is historically and architecturally significant because it was designed for the local artist, Phyl Busst, by the noted architect, Alistair Knox, who was a leading figure in the development of the 'Eltham style' of architecture. Knox went on to build other significant buildings in the area, to popularise the use of recycled materials and adobe and to play a pivotal role in the development of Eltham's distinctive architectural and social character (Criterion H). The building was one of the first designed by Knox and is considered to be, architecturally, the best of the 'Eltham-style' buildings constructed following World War II (Criteria A & F). The house is historically significant because Horrie Judd, the well known local 'Eltham-style' builder, and Gordon Ford, the well known landscape designer, also played a role in its planning and construction (Criterion H). The Busst House is a very innovative building for its time in design, mud brick construction and building and site planning. In addition to its architectural importance, this building also has historic significance as an early work of the important Eltham Architect, Alistair Knox, for a well-known local artist, Phyl Busst. Busst's house is architecturally the best from the early years of the revival in mud brick building at Eltham after the Second World War and also illustrates the start of the environmental design movement that characterised the Shire from the 1950s to the 1970s. Knox was the leading figure of that movement in building design and construction throughout the period and was the pivotal figure in the development of the Shire's distinctive residential character. Plan basically rectangular, curved eastern end. Walls solid mud brick (adobe). Roof flat roof, originally bituminous felt clad. Features are the very innovative design, curved end wall, planning, first floor roof balcony, simple interior with one large room on each storey, with kitchen and laundry off the ground floor and the one bedroom and bathroom off the first floor. Also see history section. 3.14.2 Using Australian materials in construction.